Study Parameters: FScan – Multi-peak Average of ten (10) steps without orthotic; Multi-peak Average of ten (10) steps with orthotic. 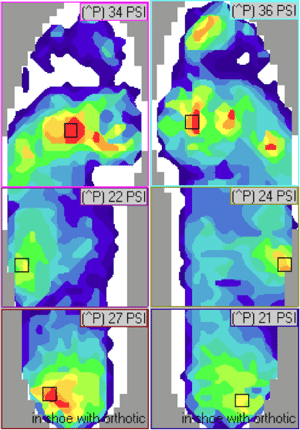 Clinical Findings: 30% reduction of peak forefoot pressures on the right foot and left foot with shoe and orthotic. 3-Dimensional readout of walking gait.